At Helga's we provide a wide range of exceptional custom tailoring services and handle a variety of complicated and specialized tasks. Our expert tailors can reconstruct any piece of clothing, often completely disassembling an item and reworking the elements to attain a flawless fit. We work with clothing for men, women, and children as well as with professional tailoring of men’s suits. Bridal attire and formal wear is our hallmark. With sophisticated skill and adherence to the highest standards of quality, we restructure store-bought suits to specific measurements, creating a sharp look and exquisite fit. Our clients bring cocktail dresses, jacket suits for men, pant suits for men and women, a large assortment of designer jeans, slacks for men and women, and skirts of many different styles and textures. Many of our clients bring items to us previously altered at a local cleaners or an in-house tailoring service in department stores, requesting corrections to these alterations. We regularly work with leather as well, altering sizes, patching holes, replacing zippers, and repairing leather bags and purses. Our commercial-grade professional sewing machines recreate original stitches, and we always match the thread to the original color. When adjusting the length of any item, we reproduce the precise look of the hem unless specified otherwise by the customer. Some of our alterations and repairs are completed by hand, especially when the fabric is too delicate for machines. We also fix straps on backpacks and messenger bags and specialize in denim repair. An order is normally ready within 5 business days. However, accommodating our clients’ busy schedules is a priority for us. Upon request, we offer same-day and next-day service for any tailoring need. Extensive alterations to suits often require an extra fitting. In such cases, only 48-hour turn-around services are available. 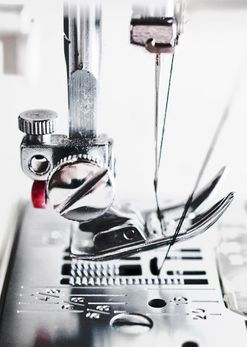 Certain services, such as sewing on a button, patching a hole, or stitching a tear, can be completed at the time a customer comes in. To accommodate our clients’ busy schedules, we open our shop at 9:00 a.m. and close at 6:00 p.m., Monday through Friday, and work on Saturday from 10:00 a.m. to 2:00 p.m.
At Helga's, we strive to not only enhance the fit, feel, and look of our clients’ clothes, but also to create a pleasurable collaboration. A clear understanding of our clients’ needs is of vital importance to us. We take time with each customer to listen to the desired results and to explain alteration options. Our professional team is available to recommend solutions to style and fit for each specific body type and to find creative ways to accentuate the most flattering body features. To ensure the best results, we encourage customers to bring photos of what appeals to them and to ask many questions. Fostering excellent communication with our customers is essential—we understand the great disappointment of taking a pair of pants for hemming only to discover that they have been shortened too much. We take great pride in our work and measure success by our customer satisfaction. If for some reason, a client is dissatisfied with the results of our work, we will redo the service free of charge. Our mission is simple: to deliver the highest level of excellence to our customers through personalized service, established expertise, and flawless work.